First race at Snetterton a few weeks back didnt start well. So here are the excuses!! The weather was quite bad/wet and with brand new Direzza tyres I was clearly far too cautious bedding them in and the result was that I was in the back quarter of the grid after quali for race 1. Cars had been going off everywhere and I had a few moments/spins which is unusual. Quali 2 for the second race was an improvement and in a very mixed field with a drying track things went much better. 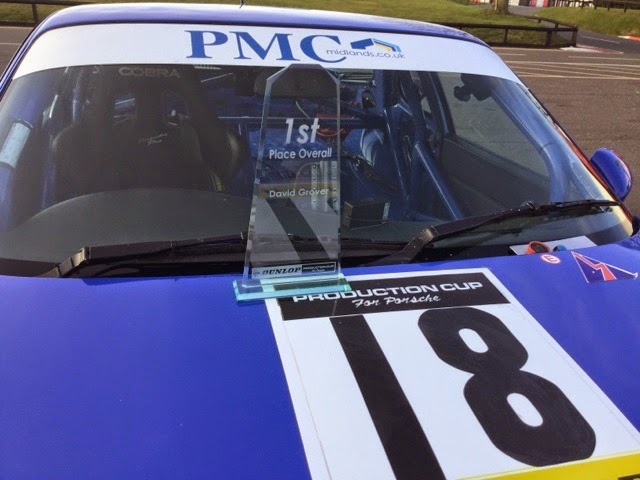 We then had a few hours wait til race one and in the meantime I collected my glass overall winners trophy for the Dunlop Production Cup fron last season, seen here on the cars bonnet, so was feeling confident. So race one started in the dry and I grabbed a few places quickly and after 38 minutes of hard graft in a 40 minute race made it to third position in class and mid table overall, so a trophy at least I thought and then I broke down and had to quit the race. The back up crew quickly sorted the problem so I was ready for race two with seconds to spare. Race two went much better, I finsihed P12 overall, first in my class and was consistently faster than my lap times least year at the same track by over 3 seconds. So a long day but overall a great start to the season. Race two in a few weeks time at Silverstone.